Grain bins are used to build homes in Haiti. A group from Charles City is raising money for a mission trip to Haiti. Gloria Carr is one of the 27 people heading to the country’s capital of Port-au-Prince in January with plans to construct 10 “homes” out of metal grain bins for an orphanage. “Seven of those homes will be used for classrooms in the orphanage and three of them will be homes for teachers who work in the orphanage,” Carr said. 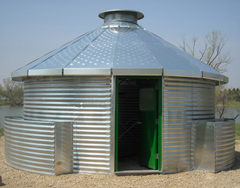 The round metal homes are produced by Sukup Manufacturing, a grain drying and storage business based in Sheffield. The homes cost around $6,000 each and the Charles City group headed to Haiti is also buying medicine to provide to Haitians. The group has set a goal of raising $100,000 to pay for the trip. A fundraiser will be held on October 15 at the Sleep Inn in Charles City starting at 6:30 p.m. The “Harvest For Haiti” event will include dessert, live music, games and an auction. “The attendees at the event…we hope they’ll be able to contribute by just playing games, take part in the auction event, enjoy the music and maybe leave us a contribution at the end of the night,” Carr said. Anyone who would like to contribute can also contact Gloria Carr at 641-330-0989.